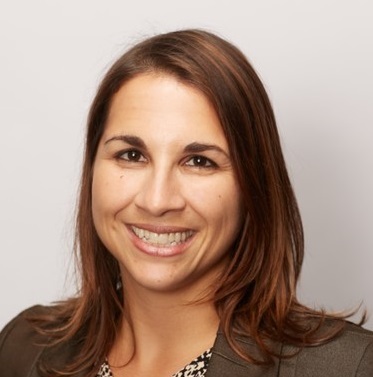 Each week, IAVA’s Research Director, Jacqueline Maffucci, PhD, reports on and analyzes the VA disability benefits backlog. Today the VA reported that the backlog decreased by only 55 claims this past week and the total number of pending claims increased by more than 3,200. 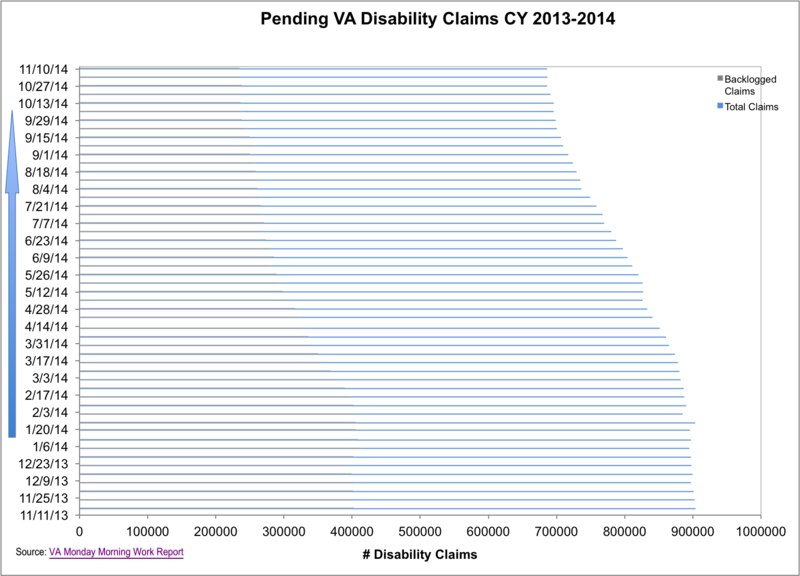 This means that in total, about 520,000 veterans are waiting on a disability claim decision from the VA, with about 235,000 veterans waiting for 125 days or more. While the VA has made some great progress overall, there has been a slowdown in that progress since October. 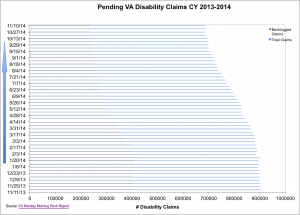 The VA averaged a decrease of less than 1000 backlogged claims per week in October. 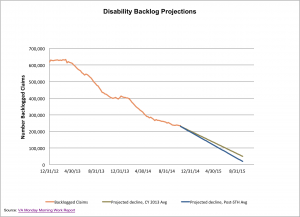 With 45 weeks remaining until the FY 2015 deadline, the VA will need to reduce the backlog by more than 5,200 claims per week to eliminate the backlog in time. 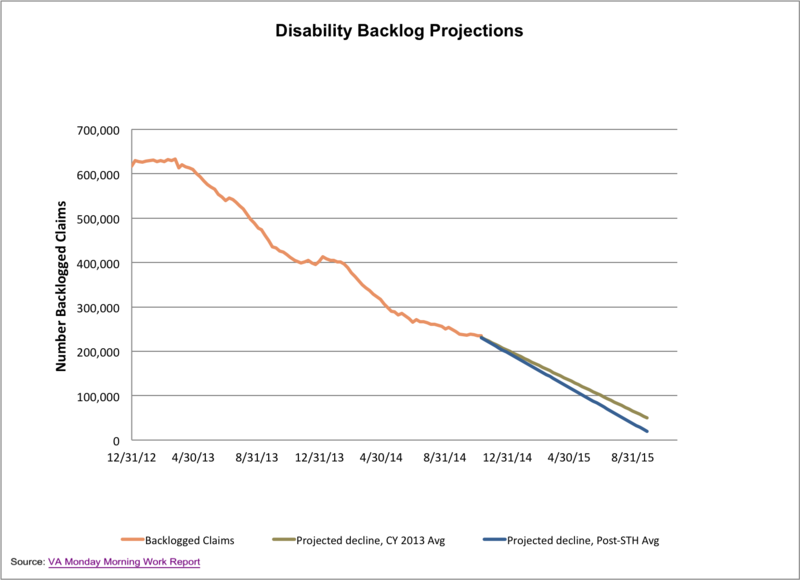 The charts below show the recent progress in reducing the backlog, as well as the projected decline in backlogged claims based on the average weekly reductions since March 2013. Tomorrow, Tuesday November 11th, our nation will pause to recognize Veteran’s Day. On this day, the nation honors the contributions and sacrifices made by our veterans, military service members and their families. As we reflect on the talents and the sacrifices of these individuals and their families, and the promise that they made to protect this nation, we must also remember the promise that we made in return. Over the last 18 months, the VA has made a great deal of improvements to the disability compensation system. It has also decreased the backlog by 63%. This is great progress but progress has slowed this last month and there remains more work to be done. There is no better time for our nation’s leaders to recommit themselves to ending the VA backlog than now. We commend Secretary McDonald in his announcement today outlining a broad plan for reform at the VA, focusing on a customer-first mentality. As we approach Veterans Day and beyond, we look forward to supporting these efforts and continuing to work with the VA, the veterans community and the nation to celebrate the unique talents and spirit of service that our veterans, service members and families demonstrate daily. To hear more about the veterans who have waited or continue to wait in the backlog, visit http://www.thewaitwecarry.org.